If you’re in need of a last minute gift for someone on your list, but haven’t a clue what to get, wow them with a personal touch of something homemade. Voila! Instant elegant party treat. With some cute Christmas bags or clever wrapping, you’ve got a nice homemade gift for friends and family, along with a boost in the Christmas spirit. Line a large baking sheet with foil. Stir bittersweet chocolate in a medium metal bowl set over a saucepan of simmering water until melted. 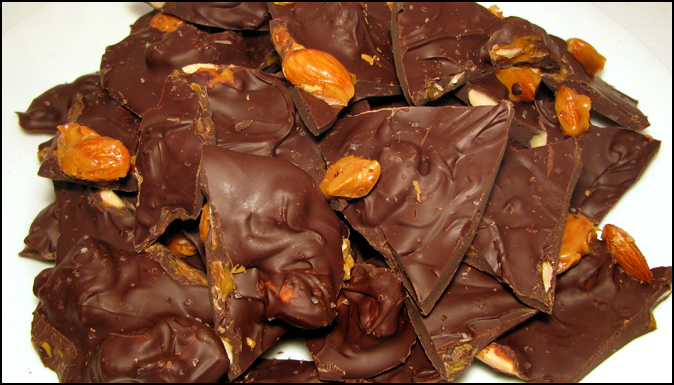 Stir in 3/4 cup chopped candy and crushed cookies; spread over foil. Sprinkle 1/4 cup candy over. Drizzle with melted white chocolate. Chill until set, about 30 minutes. Break into shards. Line a baking sheet with a silicone baking mat or foil. Combine sugar with 2 Tbsp. water in a small saucepan. Stir over medium-low heat until sugar dissolves. Bring to a boil and cook, occasionally swirling pan and brushing down sides with a wet pastry brush, until caramel is dark amber, about 5 minutes. Remove from heat. Immediately add butter; whisk until melted. Add almonds; stir until well coated. Transfer to baking sheet, spreading out to separate nuts. Let cool. Break up any large clumps of nuts. Set aside 1/4 of nuts. Find the full recipes here. 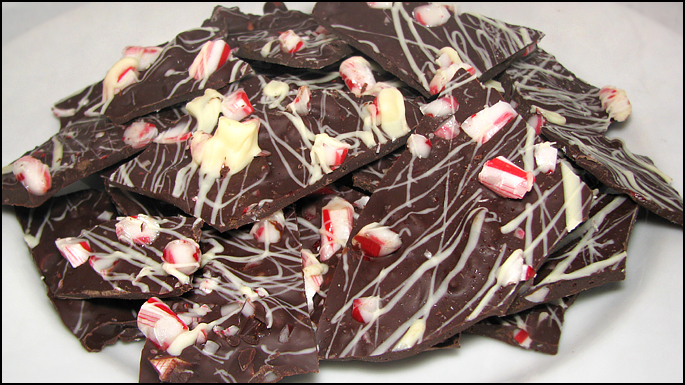 Gallery | This entry was posted in Food Adventures and tagged Almond Bark, Brittle, Candy Cane, Christmas. Bookmark the permalink.